1. Preheat the oven to 190°C, gas mark 5. Slice the tops (including the stalk) off the squash, scoop out the seeds, along with any fibres and pulp; discard. Put the hollowed-out squash and the lids on a baking tray, brush with the oil and season. Place a whole sage leaf in the middle of each squash and roast for 40-45 minutes, until tender and caramelised. Discard the whole sage leaves. 2. Meanwhile, soften the leeks in the butter in a lidded frying pan, stirring over a low heat. Add 3 tbsp water, cover and cook gently for 10 minutes, until very soft. Add the garlic and sliced sage and cook, uncovered, for 1 minute. Stir in the spinach, allowing it to wilt, followed by the grains. Take off the heat. 3. Season, stir in 2 tbsp water and leave to cool for 10 minutes. Stir in the crème fraîche and Gruyère. 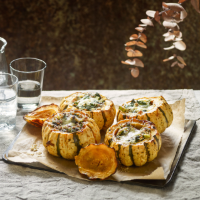 Spoon into the squash and bake for 20 minutes, until piping hot and the cheese has melted. Serve with the lids alongside.